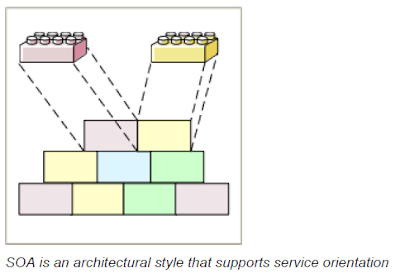 Ivan Junckes Filho: What is Service Oriented Architecture (SOA)? This article will give you an introduction about what is Service Oriented Architecture (SOA) and the different roles that interact with this. From a business view, a service is what is needed to support the business process. Think about what your company does on a day to day basis and break those business processes up into repeatable business tasks or components. A service is an application component deployed on a network-accessible platform hosted by the service provider. Its interface is described by a service description to be invoked by or to interact with a service requester. Well-defined quality of service capabilities. Well-known endpoints. An endpoint is a destination on the network that receives service requests. Offer services with published interfaces, policies and endpoints. Use services and access them securely and reliably. Provide extensible discovery, selection, metering, monitoring, logging, and more qualities of service. Breaking business processes up into repeatable business tasks or components. 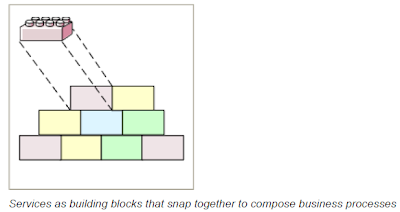 Assembling the solution by snapping components together. What is a Service Orientation? Building on the definition of a service, service orientation is a way of integrating your business as linked services and, more importantly, the outcomes that they bring. SOA is the IT architectural style that supports the service orientation thought process and makes it a reality. Services are repeatable business tasks. Business processes are a series of services snapped together like building blocks. SOA is an architectural style that makes this possible. SOA helps make building and adjusting composite applications fast and easy. SOA provides business managers with capabilities to expose a set of services to clients and partner organizations. SOA is an architectural style that requires a service provider, requester, and a service description. It addresses characteristics such as loose coupling, reuse, and simple and composite implementations. SOA is a programming model complete with standards, tools, methods, and technologies such as Web Services. SOA is a set of agreements among service requesters and service providers that specify the quality of service and identify key business IT metrics. In the next articles we will continue to talk about SOA. Source: VW003 - Introducing the Value and Governance Model of Service-Oriented Architecture, IBM Corporation, 2007. The blog that you shared about SOA is very clear and interesting.best java training in Bangalore. Thanks for sharing your informative article.Keep updating such a interesting Blog. I like your Blog,its really amazing with impressive content.keep updating..
Visit Learn Digital Academy for more information on Digital marketing course in Bangalore https://www.learndigital.co/.